The Quiltzette: We're Now a Horn Furniture Dealer! Drum roll please . . . Cortez Quilt Company is now an authorized Horn sewing room furniture dealer! We have floor models in the store of the two pieces shown here, and there are many more to choose from. Visit the Horn website to see all of the options that are available and note that our prices will be LESS than what is listed on their website. Advantages of Horn include . . .
- Free, fast delivery to your front porch! Our new Horn line is replacing what we've sold previously - Tailormade. As much as we liked that brand, it has become extremely difficult to get merchandise in a timely manner from the company so we are discontinuing Tailormade. 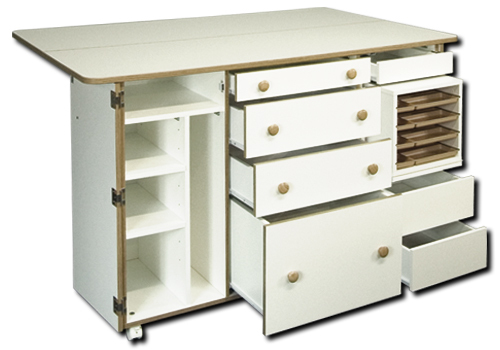 If you have purchased Tailormade furniture from us and would like a matching piece we can still order from them for a limited time. 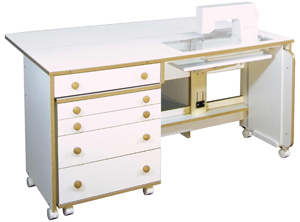 NOTE: We have the Tailormade cutting table that we've been using in our classroom available at a discounted price. Call 970-565-7541 today if you're interested in it. This new collection arrived last week. Beautiful and unique colors. The next day this elegant grouping arrived. 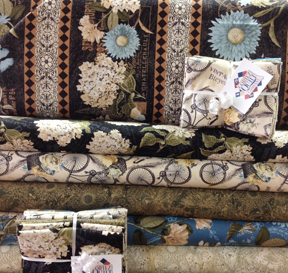 The border fabric is gorgeous and the bicycle fabric is fun! We also recently received some beautiful new widebacks in green, red, purple, cream, and tan. 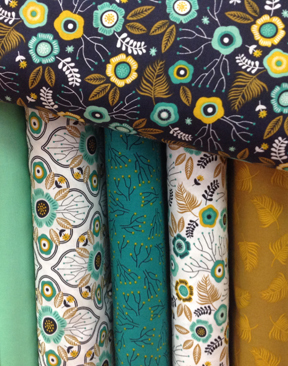 Judy Bryan made this cute sample for the store to showcase our new chalkboard fabric. Well, the requests for a class have been so frequent that we decided to add it to the schedule. Judy will add a new feature for the class . 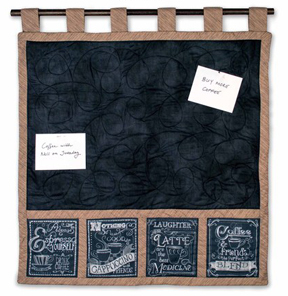 . . the four little coffee-themed panel pieces at the bottom of the wall hanging will be turned into pockets. Perfect to store chalk or markers to write on the message board or to hold a notepad, coupons, car keys, or whatever else needs to find a home in your kitchen. The pattern is free so why not sign up today to make this cute project. 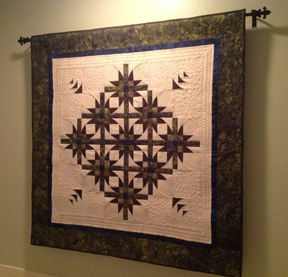 You can make so many beautiful wall hangings and other items using raw edge applique. Once you know a few tricks of the trade, the technique is fairly straightforward. 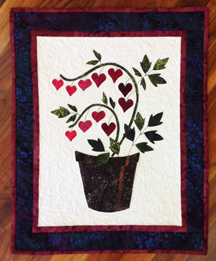 Guest teacher Ila Starks will teach Beginning Raw Edge Applique and share what she’s learned over the course of many years making a wide variety of projects using raw edge applique. In this class students may choose from one of twelve different patterns from the book Seasonal Sillhouettes. The one shown here if for February (note the hearts!) and there is one for each month of the year. Please join us for this free, every-other-month event. Bring a project you’re working on or start something new and sew the afternoon away. Light snacks provided. Sewing Sunday is limited to 12 people so call 970-565-7541 to sign up today! Have you ever made what you thought was going to be a lap quilt and then decided it was so beautiful that it deserved to be displayed on a wall rather than draped over the back of the sofa? No problem. You can add a sleeve to your work of art even after it's been quilted and bound. Here's how. 1. Cut a strip of fabric 8-10" wide (depending on the diameter of what you intend to use to hang your quilt) and 2" shorter than the top width of the quilt. You may use muslin or, preferably, use fabric that matches or coordinates with your quilt backing. 2. Hem both short ends of the fabric by pressing 1/2" to the wrong side twice and then machine-stitch. 3. With right sides together make a 1/2" seam on the long side of the fabric to create a tube. Press seam open. 4. Turn tube right-side-out and press flat with the long seam centered in the middle of the tube. 5. Position the tube on the back of your quilt about one inch from the top. Pin carefully along the top edge of the tube so that the sleeve is level from side to side. 6. Use hand-quilting thread and a blind hem stitch to hand stitch the sleeve along the top edge of the quilt. Be careful so that your stitches do not go all the way through to the front side of your quilt. 7. Move the bottom edge of the sleeve up a little bit (1/3" - 1/2" depending on the size of your dowel or rod to create some extra space (aka, "give" or "play"). This will ensure that the dowel or rod is not too tight within the sleeve causing it to push forward and show once hung. Pin carefully and hand stitch down as you did the top edge. 8. Hang your quilt and enjoy!